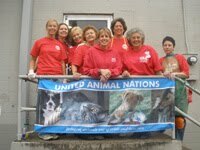 Dear friends of ours in Pennslvania contacted us wanting a short list of reputable animal organisations to give to at the close of 2010. I have expanded the list I gave to them below, thinking this might be useful for other friends and associates as they plan their final giving. 10. Your Own Local Shelters – Please give to your local shelters, whether it is food, toys, bowls, blankets, towels. They are often in need of the necessities and please consider fostering. One animal in foster saves two lives (not including your own).